First, if you’re unfamiliar with Viticulture, you can read our Double-Take Review, but just know that this worker-placement game was in our Top 10 Games of 2013, and set the bar for how a Kickstarter campaign should be run. Tuscany is a complete “set” of expansions. There are three Tiers of expansions, and you unlock them as you play, sort of like the “Legacy” line of games of designer Rob Daviau. But unlike those games, these expansions don’t completely take over the game such that you can never play it again. They’re just new pieces you can add going forward. 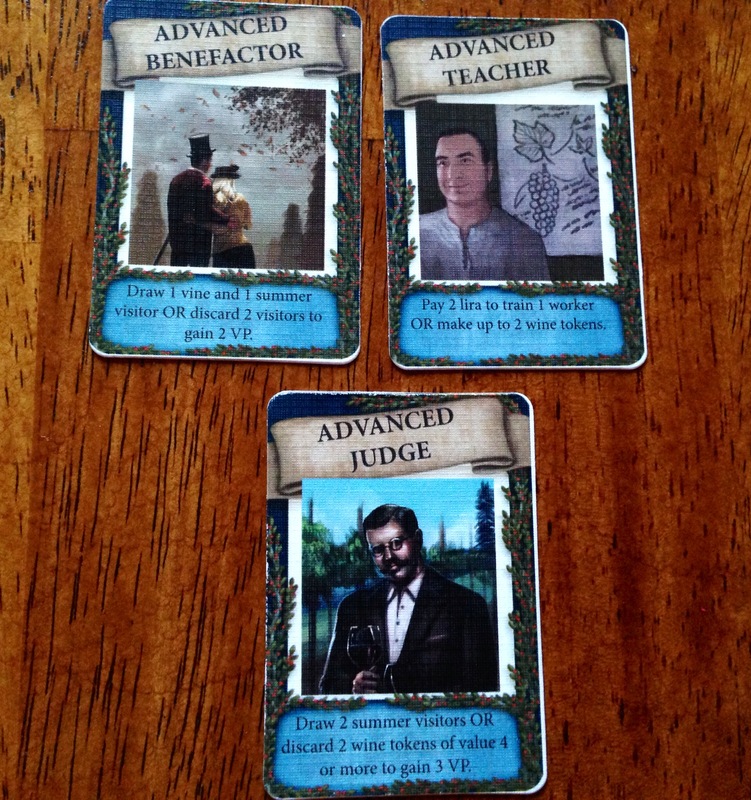 Please note, this was a prototype version of the game, so the components are not final, or final quality. For those with a 1st-edition copy of the game, there are a few additions, clarifications, and errata. Nothing major, but they are helpful. For instance, the old “Crush Grapes” action is now “Make Up to Two Wine Tokens.” This is much easier to explain than Crush Grapes was. There are so many expansions in the box that I only had time to get through the First Tier! First we have the Mamas & Papas expansion, which gives each player slightly different starting resources. There are two decks of cards, and you pass out a Mama and Papa card to each player. Each one will have some money or resources that you start with, but most Papa cards also have a choice to make–generally in the form of getting either a free build of a Structure, or the cash equivalent of that structure. This is a tough decision, and in each of our games, various players made various decisions as to whether to take the Structure or the cash. I like that it’s a non-obvious choice. And we never saw a card that seemed to give a crazy advantage over another one. The Mamas & Papas expansions gets a thumbs-up. The next expansion is Property. Each player gets three cards–a $5, $6, and $7 card–that are placed over the player’s fields. These are treated just like regular fields, but there’s now a space that reads “Sell Grapes or Flip 1 Property.” You choose which Property to flip–though it must be free of vine cards–and you get that amount of money. You can’t plant anything there until you pay back the loan and use the space again to flip the Property back over. But there’s no penalty if you never pay it back, so you may not need to. A couple of people got loans this way. A couple didn’t. One player paid back the loan. The other didn’t. It’s an easy and seamless expansion that just adds more interesting decisions. The Property expansion gets a thumbs-up. The next expansion is the Patronage, which is another deck of cards. 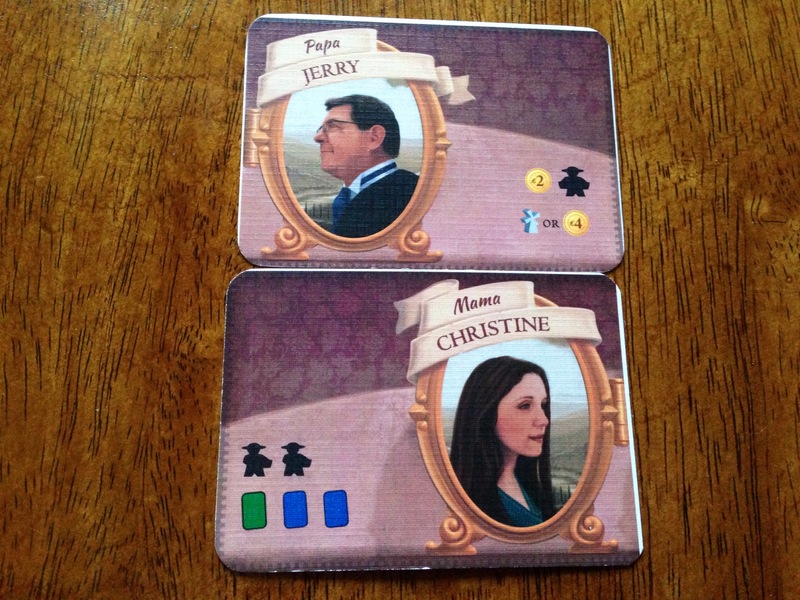 Each player is dealt one at the beginning of the game, and it’s handled just as a Wine Order card. Each card is identical on the left side of the card: Discard any wine token of value 5 or higher and get 3 VPs. You place the card under your player mat, with the righthand side hidden underneath. That’s because everyone has a different secret goal on the right. At the end of the game, if you’ve fulfilled the goal, you get 2 bonus VPs. Some goals are independent of other players, such as “Have at least 6 structures.” Others are relative to other players, such as “Most planted vine cards on 1 field.” Ties are okay in this case. This is a mostly good expansion, though a couple of them seem easier to me than others. For instance, I had one that was “Have at least 3 different planted vine cards.” Pretty simple, since almost any strategy has you planting vines anyway. And even if I was going with a strategy of only planting one field, I could easily fulfill that. Another card is “Have the fewest workers.” If you choose to go for that one, it’s setting you on a very specific strategic path–one that’s more difficult than mine, which has me doing something I’d be doing anyway (planting vines). And both are worth the same number of VPs. This isn’t a dealbreaker; I just like those types of cards to all require the same sort of effort. But overall, I still like the cards, and they can be a way for someone who’s not sure about a strategy to have something to grasp, and a short-term goal to shoot for. The Patron expansion gets a thumbs-up. Finally, we have Advanced Visitors. These are just updated versions of some old Summer and Winter visitors. What makes these different is that there are new options on them that make them useful whenever you draw them. My biggest problem with the base game was that some of the Visitor cards seemed swingy–depending on when you drew a certain card, and what your strategy was, it was either awesome for you or dead weight. This expansion takes care of my one complaint with the last game: Now Visitor cards are useful whenever you draw them. Yes, some are more useful to some people, but that’s okay with me. The Advanced Visitors get a thumbs-up. And that’s just the Tier 1 expansions! Tier 2 includes some new Visitors, an extended board, some new Structures, and a batch of all-new Workers! Stegmaier’s philosophy on Tuscany was that, rather than mete out a few expansions in different expansion packs, he wanted to give everyone everything, all at once. Yes, that makes Tuscany expensive. In fact, it’s more expensive than the base game. But even with just the Tier 1 expansions, this is a great addition. It adds new and interesting things, and “fixes” my personal problem with the base game. (And it should be noted that plenty of people have zero problems with the base game’s Visitor cards, so don’t let my opinion scare you off.) And all of this is just 1/3 of the included expansions! The campaign has a little more than one day to go. 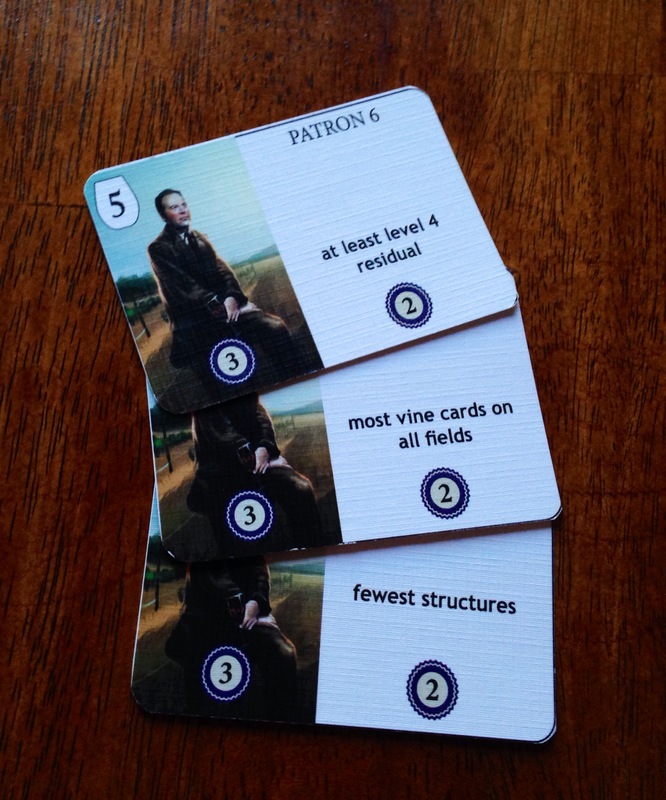 If you never picked up the base game, there are options to add Viticulture to your pledge. 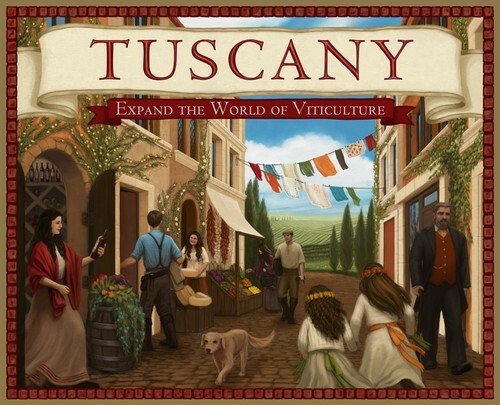 And if you have a 1st-edition copy of Viticulture, you can get the updates and upgrades for free with your pledge for Tuscany. 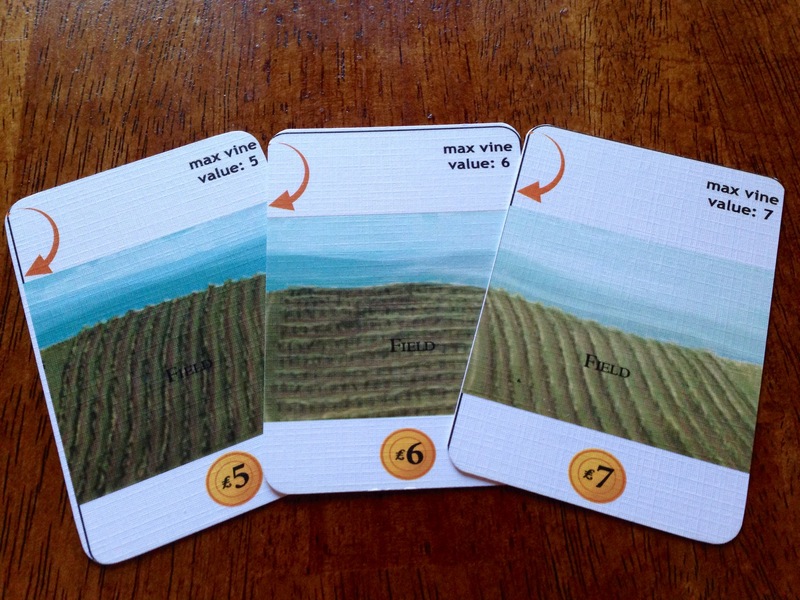 Viticulture was one of our favorite games of last year, and this expansion for it is terrific. Tuscany gets a thumbs-up. Go back it!